Young golfer aces brand new golf holes in the aces of nine days. Sydney’s Bonnie Doon Golf Club has recently received a makeover courtesy of the Geoff Ogilvy and Mike Clayton course design team. Since May 1st, six brand new holes have opened including two new par-3’s, and 18-year-old Noa Yap already has holes-in-one on two of them. Yap plays off a handicap of two at Bonnie Doon Golf Club and in the space of nine days achieved a pretty amazing feat. On May 2, Yap saw his ball hit the flagstick on the bounce at the new 166m 13th hole, and fall into the hole. Nine days later, his wedge at the 120m 15th hole had the same result. Now if you’re one of those golfers who is yet to mark an ace down on your golf card, you’d better look away now. 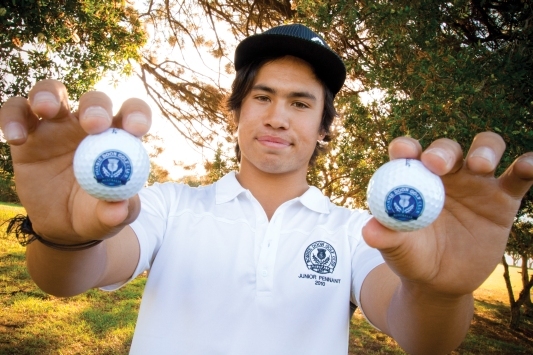 Yap, at only 18-years-old, now has five holes-in-one to his name.